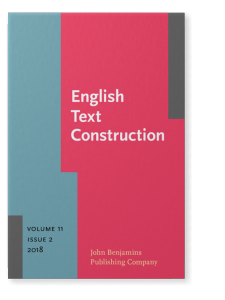 English Text Construction (ETC) is a double-blind peer-reviewed international journal of English Studies published by John Benjamins (Amsterdam & Philadelphia). The journal offers a forum for currently converging tendencies that place the text-constructing subject in centre stage across the three disciplines of English studies, viz. literary studies, linguistics and applied linguistics. For more information on the journal's aims and scope, see the Benjamins website. English Text Construction appears twice a year (in Spring and Autumn; ca. 300 pages) and is currently indexed in Linguistics and Language Behavior Abstracts (LLBA), MLA Bibliography, Scopus, IBR/IBZ and Emerging Sources Citation Index (ESCI). The journal mainly publishes scientific articles presenting results of original research and book reviews, but also seeks to publish in-depth review articles covering the current state of the art on a given research topic as well as squibs stirring debate on a particular point of interest. As a complement to the publisher's website, which exhaustively lists tables of contents and abstracts of past and current issues, this website provides guidelines for article submissions, book reviews and special issues and lists forthcoming issues and articles in press. All submissions to the journal are managed and refereed via this website. Authors or referees who do not have an account yet can register; those who do can log in and track their submissions or submit their referee reports. English Text Construction is published with the support of the University Foundation and the Belgian Association of Anglicists in Higher Education. Since the launch of Thomson Reuters' Emerging Sources Citation Index (ESCI) in November 2015, ETC has been included in this index, intended to "provid[e] earlier visibility for sources under evaluation as part of SCIE, SSCI, and AHCI's rigorous journal selection process". ETC's CiteScore, SNIP and SJR factors for 2017 are 0.69, 1.072 and 0.199 respectively.